Inspired by the original Splash collection, the Marc Jacobs Splash Rain Eau de Toilette is a watery floral fragrance that evokes the cool sensation of summertime showers. Effervescent top notes of Clementine, Cypress and Strawberry give way to a light bouquet of Sunflower, Orchid and Passion Flower, before succumbing to warm, earthy base of Amber, Musk and Moss. A crisp, refreshing fragrance housed in an elegant, glass cube bottle. Designed by Perfumer Laurent Le Guernec, the cool scent recalls the smell of fresh summer showers, wet grass and flowers. The subtle blue hue evokes the refreshment of a summer shower. 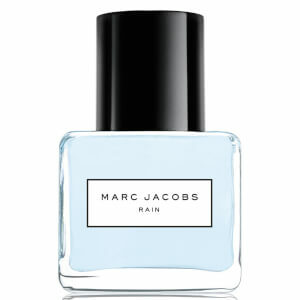 Heart Notes: Tropical Rain Accord, Passion Flower, Sunflower, White Orchid. Base Notes: Amber, Tree Moss, Teak Wood, Musk.